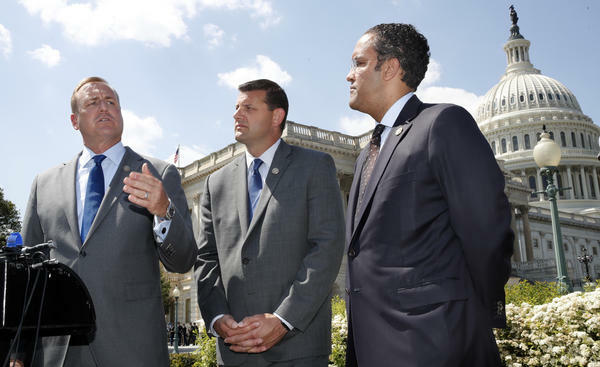 Rep. Jeff Denham, R-Calif., (left) speaks next to Rep. David Valadao, R-Calif., and Rep. Will Hurd, R-Texas, during a May 9 news conference on a discharge petition to force votes on immigration legislation. At a Nashville campaign rally last week in Tennessee, President Trump spoke bluntly about immigration as a midterm election issue that he believes will preserve the GOP's House and Senate majorities. "The Democrats want to use it as a campaign issue, and I keep saying, 'I hope they do.' The fact is the Democrats are lousy politicians. They are lousy on policy," he said. The president argued that his administration's hard-line immigration policies and recent crackdown on people and families trying to enter the U.S. along the Mexico border is "a good issue for us, not to them." Conservatives on Capitol Hill agree with the president and are deeply skeptical — if not outright hostile — to any legislation that draws significant Democratic support and creates any new paths to citizenship. They are increasingly at odds with the GOP's more moderate wing that includes lawmakers running for re-election in some of the most competitive congressional districts. In a series of escalating events prior to the Memorial Day break, conservatives took down a popular farm bill on the House floor to take a stand on immigration. At the same time, moderates continue to agitate for signatures on a discharge petition that would force the hand of party leaders to hold votes on immigration legislation if they reach 218 signatures. As of Monday, there are 213 signatures on the petition, mostly Democrats. Rep. Jeff Denham, R-Calif., is one of the leading proponents on the legislative gambit, which is sharply opposed by GOP leaders. Unlike most of his GOP colleagues, Denham has argued the only way forward on immigration legislation this month is a pared-down bipartisan bill that would create a path to citizenship for people who were brought to the U.S. as children but now reside in legal limbo, in exchange for an influx of cash to secure the U.S.-Mexico border. Denham told CNN that moderates are trying to reach a legislative solution that GOP leaders can support, but are keeping the discharge petition alive as a sort of legislative insurance policy. "We are still working with the speaker, House leadership to come up with that bill, hopefully, a compromised bill, and if not move forward on a full debate in front of the American public," he said. "We've got enough signatures," Denham added. "We'll have more members signing on as soon as we get back." The House has not attempted to take up any immigration legislation under Trump because GOP leaders have been unable to draft a bill that can pass on GOP votes alone, and unwilling to advance bipartisan legislation if there is no guarantees Trump would sign it into law. The president's rhetoric and an emotional and fractious debate about how people and families are being treated along the U.S. Mexico border right now have also mobilized Democrats to fight — not compromise — with Trump on immigration. Protesters gathered in more than two dozen cities across the country last week to protest the Trump administration's policy of separating immigrant parents and children at the Southern border. At least 600 children were taken from their parents in May as part of the latest crackdown on illegal immigration. "It is entirely the Donald Trump administration's fault," Rep. Ruben Gallego, D-Ariz., a leader in the Congressional Hispanic Caucus, told MSNBC last week. "This is all because of Donald Trump, and this is all because they're trying to appease their base. That's all this is." Over the Memorial Day recess, a growing number of congressional Democrats announced plans to introduce legislation to counter Trump's immigration policies. House Democratic Caucus Chairman Joe Crowley, D-N.Y., announced plans to introduce legislation to enhance congressional oversight over Immigration and Customs Enforcement and Customs and Border Patrol by requiring formal record-keeping and reports to Congress on all stops and searches at the border. "In order to better protect our country, as well as the rights of every person, we need data on every encounter and stricter oversight of these agencies who've become the key enforcers of President Trump's anti-immigrant agenda," Crowley said in a statement. Senate Democrats like California's Dianne Feinstein, the top Democrat on the Judiciary Committee, are working on legislation that would block the separation of families at the border. "Congress has a moral obligation to take a stand here," she said in a statement. The volatile mix of intra-GOP fighting and rising Democratic opposition is fueling more skepticism than confidence that the House will ultimately pass any immigration legislation this month, let alone bills that could clear the Senate's 60-vote hurdle and President Trump's veto pen. House Majority Leader Kevin McCarthy, R-Calif., winked at that reality last week in an interview with Fox Business News when asked what his priorities would be come 2019, if Republicans hold the majority and he is elected speaker. He said he'd focus on economic growth, and that "means solving immigration." Congress returns to Washington this week. And on the agenda for the House, a contentious debate over immigration. It's not what Republican leaders wanted. But faced with an uprising of both conservatives and moderates in the party, they relented. This week, the party strategizes on which bills to bring for a vote this month. NPR congressional correspondent Susan Davis joins us now to preview the immigration fight ahead. SUSAN DAVIS, BYLINE: Hey, Ari. SHAPIRO: How does Speaker Paul Ryan plan to reconcile the competing demands between conservative and moderate Republicans on immigration? DAVIS: Ari, I have no idea (laughter). SHAPIRO: OK. Thanks, NPR's Sue Davis (laughter). DAVIS: But that is what makes this so unusual. It is exceedingly rare for party leaders in any party to lose control of the floor in this kind of way. The first steps to figuring out what they're actually going to do will begin this week. As you said, Republicans are scheduled to meet Thursday morning to see what, if any, consensus they have on what this legislation should look like. The only thing we know right now is that those votes will take place the third week of June. Adding a little extra drama into this mix is a group of Republican moderates who are still working on what's known as a discharge petition. It's a pressure tactic they're using against their own party leaders that will force votes on immigration if Paul Ryan can't come up with something they support. SHAPIRO: ...Will remember that in February, the Senate tried and failed to pass immigration legislation. And then Republican leaders were like, we tried it. It's done. The debate is over. It's not going to happen this year. What made House Republicans start demanding votes now? DAVIS: Right. And when the House - when the Senate failed, Speaker Ryan's point was - we're not going to take up something that can't pass. His motivation, I think, is what all party leaders' are, is they don't want to make their members take tough votes if they don't have to. What's also interesting about what's happening now is more and more House Republicans are saying, we actually want to take those tough votes. They just want to vote on very, very different things. Conservatives want to vote on a more broad, hard-line immigration bill that their base will like this election year. Moderates are looking at a more narrow, bipartisan bill that would create a path to citizenship for people who were brought to the U.S. as children in exchange for more border security money. So they just want very different things. SHAPIRO: That division in the Republican Party kind of leaves an opening for Democrats to sway a vote. How are they using that leverage? DAVIS: So almost every Democrat has signed on to that Republican discharge petition. So they're really linking arms with the moderates in the Republican Party on this to try and force a debate. You know, Democrats look at this month and they say - look, like, if they can pass a bipartisan immigration bill on the strength of their votes and get to take credit for that victory, great. And if the House fails - and I would say that the expectations at this starting point is that there's very little confidence that this ends with a bill landing on President Trump's desk - Democrats and Republicans will just continue to use it as a midterm campaign issue. You know, immigration, broadly, is very contentious and partisan. That, we know. But on this very narrow issue of protecting the people that were brought here as children, people tend to side with the Democrats. Our own polling at NPR shows that as many as two-thirds of Americans agree with Democrats that they should be given some kind of legal status. SHAPIRO: And just briefly on immigration, there's also the question of enforcement, where there's been a lot of outrage over the Trump administration's crackdown on the U.S.-Mexico border, the policy of separating family members trying to enter the U.S. Do you expect that to come up in the House? DAVIS: This is absolutely going to come up. It's only adding to how unpredictable this debate is going to be this month. Democrats say they're working on bills that would counteract what the Trump administration is doing at the border. But we should note, Republicans - and President Trump, in particular - feel very strongly the opposite way about the politics of this, that cracking down on the border is going to help Republicans in this year's midterm elections. SHAPIRO: NPR's Susan Davis joining us from the Capitol. Thanks, Sue.